Lofthouse soft sugar cookies: This copycat version utterly and completely knock those grocery store look-alikes out of the water. They are SO easy to make and are insanely delicious! I realize that Shanon said last week that she was the last blogger to post these Lofthouse copycat cookies, but actually I’m right there with you, Shanon! While it seems that they have been all over my friends’ blogs, I couldn’t help but get in on the action as well. Seriously dangerous. Let the college kids and their ridiculous under-30 metabolisms deal with the calories. The recipe only yields around two dozen (we got 27) but they are definitely substantial cookies so while I wanted to put away a couple extra (in my stomach, that is), one cookie was definitely enough to satisfy me. For one sitting anyway. I imagine that freezing some of the dough would work great and I definitely plan to do so the next time we’re craving these bad boys. And now that I’ve found my measuring cups and set the stand mixer up in the new kitchen, it’s entirely possible that they’ll show up again sometime this week. Yay for having reasons to celebrate with cookies! Kyle and I have included these Lofthouse soft sugar cookies in the cookie platters that we assemble and bring around during our Christmas visits. We have made a sweet tradition of baking and frosting them on Christmas Eve every year since I first made them and I cannot WAIT to share this tradition with Riley this year! In addition to these soft sugar cookies, our cookie platters also always include at least some rosemary butter cookies, thick and chewy chocolate chip cookies made with Christmas M&Ms, and peanut butter blossoms. How can you go wrong?? These cookies made it to the Weekend Potluck – check it out for some other delish recipes! To make the cookies: Line baking sheets with parchment paper or silicone baking mats. In a medium bowl combine the flour, baking powder and salt, and whisk together to blend. In the bowl of an electric mixer, combine the butter and sugar and beat together on medium-high speed until soft and fluffy, about 2-3 minutes. Beat in the eggs one at a time, mixing well after each addition and scraping down the bowl as needed. Blend in the vanilla. With the mixer on low speed, add in the dry ingredients mixing just until incorporated and evenly mixed. Cover and chill the dough for 1 hour. During the last 15 minutes of chill time, preheat the oven to 350˚ F.
When you are ready to bake the cookies, scoop a scant quarter cup of dough and roll into a ball. Flatten the ball slightly and place on the prepared baking sheet. Repeat with the remaining dough, spacing the cookies at least 2-3 inches apart. Bake about 10-12 minutes or just until set. (Do not overbake! The edges should be no more than very lightly browned if at all.) Let cool on the baking sheet for several minutes. Transfer to a wire rack to cool completely. To make the frosting: Place 4 cups of the confectioners’ sugar in a medium bowl. Add the melted butter, vanilla, and milk to the bowl and whisk until smooth. Whisk in additional milk as necessary, 1 teaspoon at a time, until you reach your desired consistency. If the frosting is too loose to frost the cookies with, whisk in more sugar, ¼ cup at a time. Tint with food coloring if desired. Use an offset spatula or spoon to frost the cooled cookies. (If the frosting begins to thicken as you decorate, just continue to whisk in small amounts of milk to keep it workable.) Top with sprinkles if desired. Store in an airtight container. I had the grocery story version last night and I thought of Shanon’s post, too, about how she hadn’t made them yet…. and I had been dying to make them, starring recipes, too. Then I learned that the “trick” to their cookies is allegedly sour cream?! So I have to say I am psyched to see your version doesn’t call for any, and I’m sure they’re just as delicious. YUM! I haven’t blogged them, or even tried them. The sad reason is that I love the sugar cookie recipe I have! It uses sour cream, and it’s all soft and creamy and delicious! I’m actually afraid that this recipe might be better, and then I will be devastated. I’m really attached to my old sour cream recipe! Is that bad? I’ll have to break down and try it one of these days, because they look so fantastic, and everyone has been talking about how great they are! I like the St. Patty colors. I still haven’t made these but soon. They look so soft and delicious! These look outstanding! I love this style of cookie; every time I come home with a package of ’em, they’re gone within days (or, you know, hours). Might have to try my hand at them sometime! Sheyanne: About 12-15 large cookies. Made these today….DELICIOUS!!!! I made one batch thinking that would be enough for a BBQ with all my family tomorrow but my husband and kids seem to think taste testing a cookie means eating them all! LOL Guess I’m off to make another batch. These turned out incredible! Im having a hard time getting frosting on them because they are disappearing! excellent recipe! searched far and through many cookies to find the right consistency! this is it!!! Im trying to make these as cut out cookies…. im seeing adding sour cream? in recipes…. not sure i want to play with the flavor of these at all– they are perfect…. any ideas? more flour to get a ‘roll’ consistency? Thanks! have you tried freezing the dough? if i keep all these cookies in the house, my kids won’t stop eating them! Thought maybe I could keep the dough a while in the freezer and bake a few at a time. No, I haven’t but the recipe only makes about a dozen cookies so you could certainly cut it in half. The amount of flour in these cookies is actually the right amount in order to create the thick and dense bakery cookies they are trying to mimic. Adding sugar won’t do anything but make them sweeter and with the frosting, they are already plenty sweet enough. 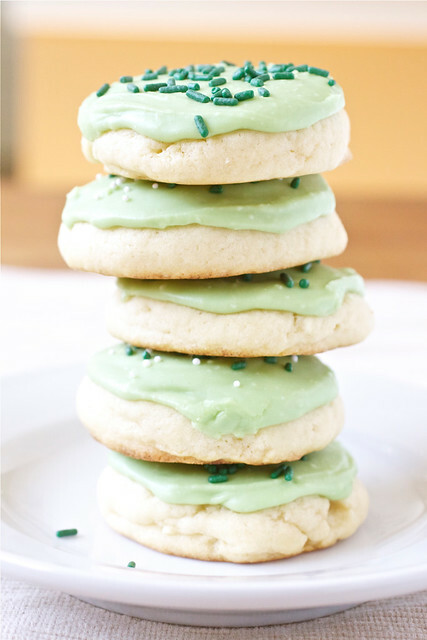 i know I am way late on this – but just stumbled across this on pinterest and while I have an old family sour cream cookie recipe, thought this would be well worth trying – one thing I can’t get over though after reading the recipe and reading through the comments is with the quantity of ingredients like 4 1/2 cups of Flour, 1 1/2 cups each of sugar and butter and 3 eggs how in the world could you possibly end up with only a dozen cookies?! I wish there was something in the pictures to show perspective, but I’m guessing these are huge – are they displayed on a dinner plate? Personally I’m not at all a fan of the ‘big as your head’ cookies (being a bit calorie conscious and all) and usually use the small cookie scoop to portion most of my baking ( I think it’s maybe 1 1/2 tblspn) … I’m guessing if I make them my standard size I’d end up with maybe 5+ dozen 2″ cookies? Thanks for your comment, Mary Lou. Believe it or not, the recipe does only make about 1 dozen cookies. I was very skeptical the first time I made them but the recipe works and I’ve made it no less than a dozen times since that first time. The cookies are not huge width-wise (the plate you see in the photo is a dessert plate), but they are thick cookies. One frosted cookie is definitely a serving for an adult. You could most certainly make them smaller – just bake them for less time. Hope that helps to clear things up for you! Hi there. I’d really like to make these for a work potluck lunch, but I’m wondering how well they stack (in order to box them up and transport them to the office). Does the frosting set hard enough to stack the cookies (say, 3 cookies high)? Thanks! The frosting doesn’t set up super hard like decorated sugar cookies but I think firm enough that you could probably stack them 2 or 3 high. Just be sure to let the frosting set up long enough before stacking especially since the frosting will be quite soft when you first frost them. It takes a few minutes for this to happen. 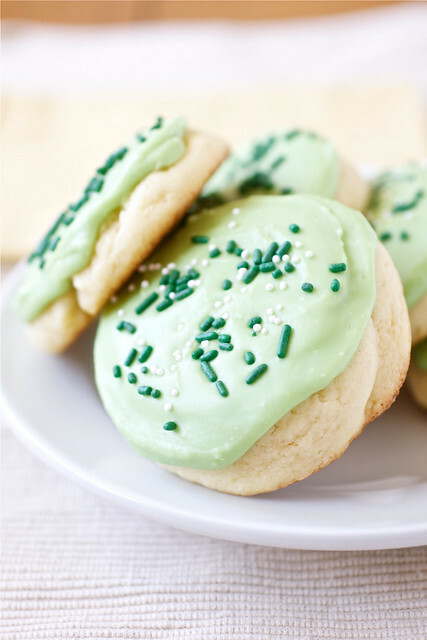 Enjoy – these are by far my favorite sugar cookie ever!! I tried this, and was surprised by how many cookies I got. I filled 3 large cookie sheets, making almost 4 dozen! I used the exact measurements and made fairly large cookies… they didnt last more then a few hours in my house. I did not try this icing recipe, i used my own. however i will say if you plan on making these, i hope you also plan on icing them as well. plain, they just tasted bland. the icing made them soft and delicious. not the best recipe out there, but easy to follow, and had a decent turnout. Sorry for the late response here, Debbie Ann, but these aren’t the roll-out type of sugar cookies you’re looking for. I do have a recipe for those sugar cookies though – http://www.smells-like-home.com/2010/01/snowmen-mitten-sugar-cookies/ That recipe is REALLY easy to work with and cookies themselves are delicious – not like cardboard, like other sugar cookies can be.